AIGA is the professional association for design. With more than 70 chapters and 23,000 members across the nation, our mission is to advance designing as a professional craft, strategic tool, and vital cultural force. Learn more about AIGA—or for questions about specific programs, initiatives, and events, or contact us. 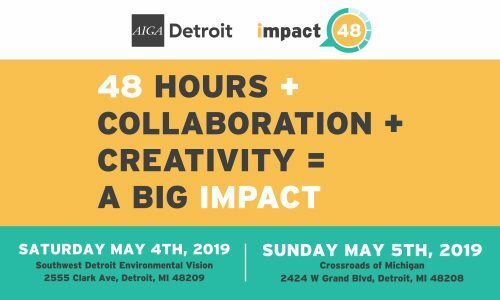 This May, AIGA Detroit is hosting our annual Impact48 event, a philanthropic design marathon! If you’re a creative that wants to get involved with your community, we would love to have you participate in Impact48!